In the idea for this week, dinner gets a new twist... as a board game. Test your taste, smell, touch, sight and trivia knowledge of ingredients and cooking terms. Then participate in cook-offs to make a meal based on the cards selected. Choose the length of the game and of dinner by deciding which courses to include: entrées, mains, desserts and drinks. Cooking reality shows and competitions are very popular. This game brings elements of those competitions into a game that everyone can participate in and lets you eat food while you're doing it. Many people are interested in the TV competitions, but think that they can't do it or feel like it is too much effort to make their own competitions. One of the key problems (I find) with cooking shows is that, as a TV viewer, you cannot eat the food. This game solves that problem and sets everything up for you to have a fun meal which encourages learning and participation. Imagine a dinner party where you don't know exactly what will be cooked before the night begins. A dinner party where you learn about food and test all your senses. If you love competitions, eating and talking about food and drink, then this is the game for you. Compete against the clock or other players in cook-offs. Use your taste, smell, touch and sight to guess what an ingredient or dish is called. Test your food and drink trivia knowledge. But best of all, you get to create great food and eat it as the board game progresses. You can choose the length of the game by deciding how many courses you want to eat. Players roll a die to move their own tokens around the board. When they land on a ? square they must answer a question. When they land on a cook-off square, they must cook - either against the clock or against others - using the ingredients for the night. What will be made in a cook-off depends on the key ingredient chosen for this course and the card that they pick up. If they answer their question correctly or win their cook-off, the player moves forward 3 spaces, otherwise they stay in the place. The next player then gets a turn and so on, until the players reach the end of the course. The game is made up of 4 potential courses: entrées, mains, desserts and drinks. The drinks course can be completed on its own, or can be integrated with the other courses. The food courses are played one after another on the main dinner plate in the center of the board. The first player to reach the end of the course gets the most points and the most time to eat freely while the others catch up. When everyone has finished the course, a competitive cook-off is done to finish cooking all the food needed for the course. Players then eat and take a break, before starting the next course. When all courses are finished, the player with the most points wins the game. To prepare for the night, the host/hostess will choose a key ingredient for each course that they will be completing. For entrées and mains the key ingredients are: red meat, poultry, fish, and veggies. For desserts the key ingredients are: chocolate, fruit, dairy, and baked surprises. The host/hostess then randomly chooses one of the four shopping lists available for that key ingredient. The host/hostess must make sure that they have all the ingredients in the right quantities for the dinner guests. These ingredients will be used to make the core courses of the night and also for the senses tests. Each ? and cook-off card has a set of symbols at the bottom which indicate which shopping list card they match to. This means that not all of the cards are used every game, only the ones that the host/hostess will have the correct ingredients for. taste - the card shows an ingredient number. The player who picked up the card must close their eyes (or be blindfolded) while another player finds that ingredient and then gives it to them to taste. They must correctly identify what ingredient they are tasting. smell - similar to taste, except the player must smell the ingredient instead. touch - similar to taste, except the player touches the ingredient instead. sight - the card shows a dish number. The player then looks in the dish book which contains pictures of dishes on one side of the page and the name of the dish on the reverse side. The player must correctly identify the name of the dish is shown (without looking at the answer). trivia - the player is asked a trivia question about food. For example, some questions will relate to food preparation techniques, or where dishes and ingredients come from. The cook-off cards that are used for each course will relate to the shopping list chosen by the host. From the ingredients bought, there will be several possible meals that can result. 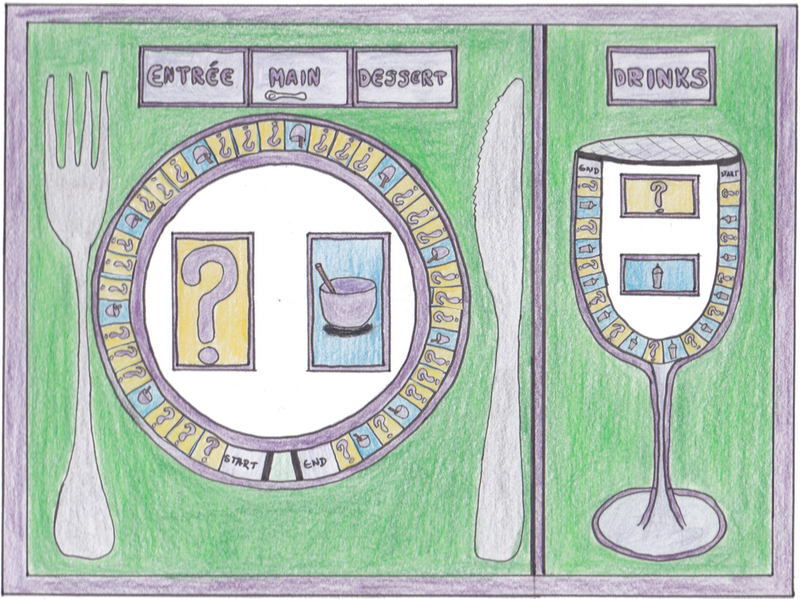 Depending on which cards are drawn through the game, the meal will change to match what happens in the game. There are two main types of cook-off cards. One is a timed cook-off where a player must finish a simple task (such as whipping cream) in a set time limit. The other type is a competitive cook-off where the player competes against another player to try to be the first to finish a simple tasks. Some of these tasks will be steps in the main dish that is being prepared for this course. While other tasks will create mini-dishes, such as a dip or a sauce that players can begin to eat straight away. When all the players have reached the end of the course, any remaining steps in making the dish are done as competitive cook-offs between participants until all steps have been completed. The drinks course is similar to the food courses, although there are more cook-off cards available. The key ingredients for the drinks course are: non-alcoholic, vodka-based, rum-based, or different beers. Although wine is very popular, unless the host/hostess is prepared to buy and open a large range of bottles, it is unlikely to be the best choice for ingredient. Each cook-off will result in a drink being completed. The ? cards will relate to the ingredients and techniques needed to make drinks. This course can be played at the same time as the other courses, for example before and after each course, to make sure that players have drinks to go with their food. Although players will be able to see all the ingredients available, the meal that results from the end will not be the same everytime the game is played. Since players will be able to eat as they play and will be encouraged to try new cooking methods, it will be a fun night. Each player will have their own token on the board. These tokens will be in the shapes of standard items to be found in a kitchen, e.g. salt shaker, pepper grinder, cheese grater and so on. One of the key difficulties in creating this game will be making sure all of the bought ingredients are used on the night. Making sure there is variety in the dishes available to be made is not too much of an effort, since many dishes have the same base ingredients. A version of this game has been implemented for the gameplay mechanic a month project as The Cookie Baking Game. In this game players concentrate on making their own batch of cookies, rather than an entire meal.